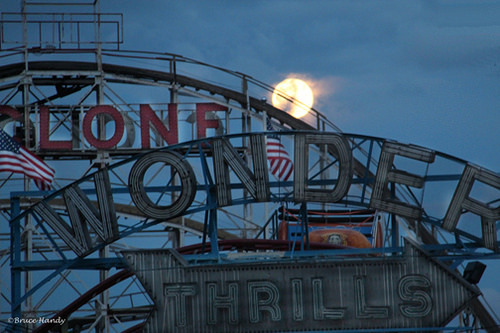 One night last March, as Coney Island’s amusement parks stood dark and silent, a full moon peered over the track of the landmark Cyclone roller coaster and the Wonder Wheel’s “Thrills” sign. Surf Avenue resident and “street photographer” Bruce Handy was taking his daily photo walk with a friend and brought home this exquisite capture. Beginning on Saturday, “A Stroll Through Coney Island Among Friends,” a photo exhibit featuring the work of five Coney Island photographers and friends who take photos of the People’s Playground year-round on a daily or weekly basis will be on view at Coney Island USA. 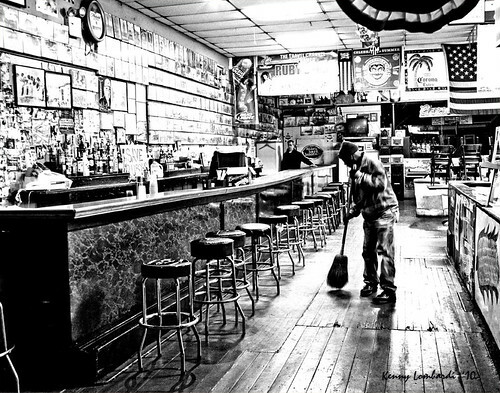 Bruce Handy, Jim McDonnell, Norman Blake, Kenny Lombardi and Eric Kowalsky are longtime friends of ATZ and contributors to this blog, so we selected five favorite photos from our archive for this post. You should know the work of these local photographers because in contrast to the many world-renowned photographers, occasional visitors and tourists who are drawn here, they know Coney inside out and in all of its seasons. The show’s title should be taken literally as well as metaphorically because these friends are often seen together, cameras in hand, riding the Wonder Wheel at sunset and strolling on the boardwalk and the pier. Bruce Handy and Eric Kowalsky live right across the street from Coney Island’s amusement parks while Jim McDonnell resides a couple of subway stops away. 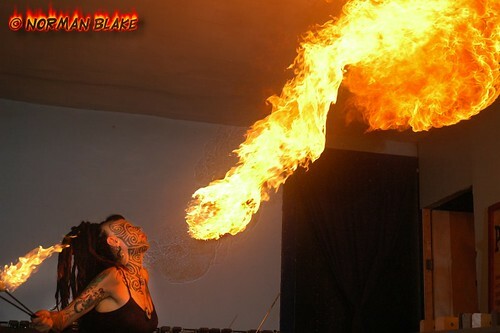 Brooklynites Norman Blake and Kenny Lombardi are official photographers for Coney Island USA, where they take photos of sideshow and burlesque performers and mermaids galore. Norman’s delightfully quirky photos of kite flying on the beach and a sea lion smooch at the Aquarium have appeared on ATZ, as have Kenny’s atmospheric photos of the Boardwalk bars Ruby’s and Cha Cha’s. As members of the Coney Island Polar Bear Club, Bruce Handy and Jim McDonnell are among the hardy group who go for Sunday swims from November through April. 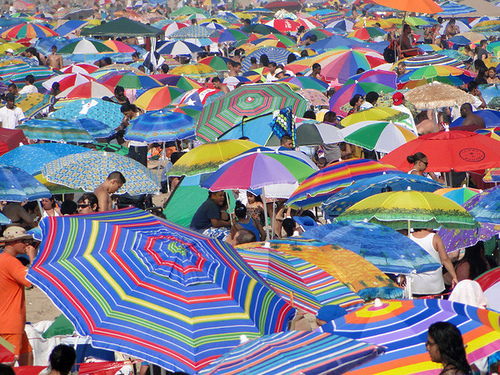 On the Fourth of July back in 2011, Jim took the amazing shot below of Coney’s beach brimming with colorful umbrellas, which calls to mind photos from the 1930s and ’40s of the beach jam-packed with people, sans umbrellas. Among other notable photos of Jim’s that have appeared on ATZ are his heartbreaking set of images shot the day after Superstorm Sandy struck Coney Island. Jim, who works professionally as a footage guru as well as a photographer for Luna Park, has been compiling a summer’s worth of dance moves into “Coney Island Dancing” videos every September since 2010. Eric Kowalsky, 23, is like a kid brother to the other four photographers, who are in their 40s and 50s. Born and raised in Coney Island, he takes his inspiration from his grandfather Abe Feinstein, who has been documenting Coney Island since he moved to Luna Park Houses with his family in 1962. Among the notable photos by Eric that are posted on ATZ are images of the demolition of Thor Equities-owned Henderson Building and the Bank of Coney Island. 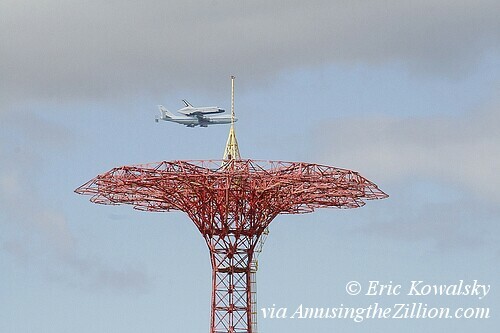 On a happier note, two icons of American air and space history meet in Eric’s awesome photo of the Space Shuttle Enterprise flying over the Parachute Jump in 2012. I agree totally with this list. I have to get out to Coney more if I want to make next year’s list! I plan on going this Saturday, I hope to see you there!